Want to be notified of new releases in shershen08/vue-styleguide-generator? For purpose of having a demo of your Vuejs components please take a look at following projects that do really great job and are really handy for you dev workflow with Vuejs: storybook for vuejs and vue-styleguidist. Initially started after reading this vue.js feature request. Now only basic proof of concept is available which can load folder with .vue files, parse it and extract basic props of it. Target is to have some tool with at least some of the React version capabilities. Idea is to have what vue-play does but in automated way - with one task run, plus READMEs, etc. Generate single html file containing all components listed with details and search out from your .vue project files. General questions please ping me on twitter @legkoletat. Bugs and inconsistencies please create an issue . Please concider to adding more information on what is the codebase you're running the generator against, what errors (with code, if applicable) you got. To keep issues list clean and relevant issues with no feedback/details/activity will be closed within 3 days. Run with Keen-UI repo produces the following DEMO html-file. Run with vuikit repo produces the following DEMO html-file. add to you package.json in script section - for example like this "build-components": "node ./node_modules/vue-styleguide-generator/" and then run npm run build-components from the root folder of the project. ✅ Works only for Vue 2.x projects. Found a bug or have a proposal - please create an issue or tweet me @legkoletat! 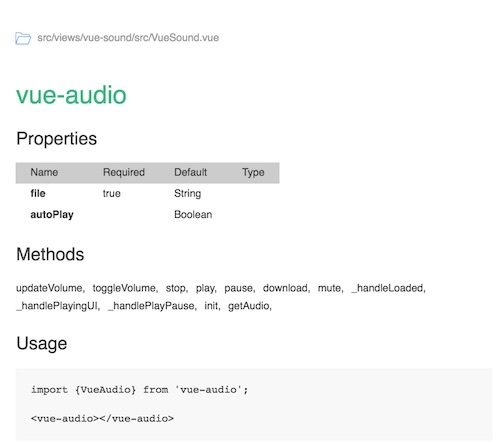 Now as from 0.9.11 also your .js files referenced from .vue files are supported. Added -o option to open the browser. Refactoring the template. Added pt-br translation by israelss. UI improvements (UX of the search block, 'Copy' component code).